Your piano needs humidity now. I service pianos in the Oakland County Michigan area. My clients live in cities like Troy, Rochester Hills, Bloomfield Hills, West Bloomfield, Livonia, Novi, Northville, and many other cities in southeast lower Michigan. One thing this area has in common is cold wintry days. This is the time of year we service our furnace, rake our leaves, and buy our boots and hats in preparation for the months ahead. If you are a piano owner in a cold climate there is another thing you should prepare for; dry air in your home that will cause many problems with your piano. I have provided a photo of a rather severe dryness related problem. In the photo of the piano’s bass bridge a large split can be seen. 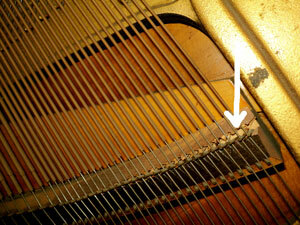 This split is caused by years of dry wintry conditions that has caused the wood of the piano to become dry and brittle. Many other problems such as; tuning instability, sticking keys or the occasional note that will not play, cracks in the soundboard, and loose tuning pins are a few of the problems caused by winter dryness. To avoid the expense of major repairs on your piano, HUMIDIFY. Humidity is cheap insurance that will protect your piano from the dryness monster. You can humidify your whole house with a furnace mounted humidifier or a stand alone console type humidifier that is rated for the number of the square feet of your home. If you choose either one of these two options you should purchase a digital hygrometer. This simple battery operated devise will help you zero in on the best humidity level for your home and the things in your home like the piano. As a rule of thumb 38 to 42 percent is a good humidity level to protect your piano. A third option is a piano humidity system. I install the Dampp-Chaser system in pianos to protect the piano from the effects of both winter dryness and summer time excessive humidity. If you are thinking about protecting your piano I would be happy to discuss this option with you. Now is the time of year to prepare your piano for the winter dryness that lies ahead. If you have a humidifier clean it, change the wicks/filter, and test it to see that it is operational. Also have your piano tuned and prepared for the times ahead with family and friends that will enjoy a well played Holiday favorite. In the Oakland County area call: Ace Piano Tuning for an appointment. This entry was posted in Piano Care Tips, Piano Humidity Effects and tagged piano care tips mi, piano care troy mi, piano cleaning tips, piano humidity michigan, piano keys cleaning mi, piano tuning mi, piano tuning troy mi, sticking piano keys by wpuser. Bookmark the permalink.